As usual our weekly summary of Brexit and a selection of the best and most informative articles. It seems as though Parliament ‘took control’ and whilst everyone knows what they don’t want, no-one knows what they really want. Negativity is so easy. Lets try a wee game….which of these would you have voted for? You could have voted for all. Confirmatory referendum – For: 268 Against: 295 – No. This is sheer dishonesty. If this proposed putting Mrs Mays option against No Deal Brexit then that would be fine. But this is not about seeking the peoples will, but trying to find a way to stop Brexit. It is the EU’s typical ploy. They never accept the result of a referendum, play hardball, threaten, and then get you to vote again so that you get the right result. What I’ve noticed about those who advocate this approach is their sheer dishonesty. First its called a second referendum; then its a ‘Peoples Vote’ (from those who think that the people are stupid and got conned the first time); and now its a ‘Confirmatory vote’ – except its not just to confirm the or not the governments plan – because Remain will be the effective default. That dishonesty is engrained so deep that even after their vote was defeated (for the third time) they still claimed victory – David Lammy for example sending out an e-mail stating “its working it was top of the list”. The only problem is that there was not a list – and people did not vote in order of preference. The MPs could have voted for as many as they wished. Incidentally if John Bercow was consistent and fair in his ruling that you cannot bring the same matter twice before the house, he would not permit a fourth vote on this, but no one could ever accuse Mr Bercow of either consistency or fairness. There is, according to the Speaker, a difference between this coming back and Mrs May’s coming back. Bercow likes the former and doesn’t like the latter. My vote. No. Customs union – For: 264 Against: 272 – I suspect that this is now the most likely outcome. It is not that much different from Mrs May’s deal, except that it would prevent us from making any trade deals on our own and we would be bound by the ever increasing number of EU rules. My vote. No. Labour’s Brexit plan – For: 237 Against: 307 – I’m not sure what Labour’s Brexit plan actually is – or how it differs from May’s apart from the Customs Union bit. Labours hypocrisy in all of this is breathtaking. If they were really concerned about a no deal Brexit they would just vote for May’s plan because it gives them almost all they want anyway. But Labours purpose is to sow dissension, to keep its varied groups on board and to get a general election. My vote. No. Common Market 2.0 – For: 188 Against: 283 – This is trying to get back to the original idea of the EU. A trading block. But without being tied to the SM and CU the EU won’t buy it anyway. My vote. No. No-deal exit on 12 April – For: 160 Against: 400 – This is the default position – and something that the ERG and DUP are relying on. But I very much doubt that parliament will let it happen. The ERG are playing a very dangerous game – risking no Brexit in order to get a clean Brexit. The DUP sound pure but I’m not sure they know what they are doing. Their argument is that they will not sign up to something that puts the Union at risk. But doesn’t the political chaos that follows from a worse EU deal mean that the Union is also at risk? What if the actions of the DUP are also putting not only Brexit but also the referendum? As a result they will not get what they want, but they will also find themselves getting something even worse than May’s deal. My vote. Yes. Malthouse Plan B – For: 139 Against: 422 – This is the idea that we carry on for a couple of years, with a No Deal following afterwards. There is little hope that the EU would agree to this. My vote. Yes. EFTA and EEA membership – For: 65 Against: 377 Personally this would have been my preferred position all along. What is astonishing about this one is that it is also the position of the SNP (as a compromise) but none of them voted for it (neither did they vote for the Customs Union, which was also supposed to be their position). For all their talk of working together and compromise they are in reality playing the same hardball game as the EU – seeking to get their way or nothing. What is also revealing is that no SNP MP ever deviates from how they are told to vote. Other parties have MPs who think for themselves, but the SNP would be as well sending robots to vote in accordance with party instructions. My vote. Yes. As regards the so called Peoples march – the Guardian breathtakingly repotted that 2 million people attended – most said about 1 million. The reality was between 300,000-400,000. A massive number but not quite the figures being shouted about. 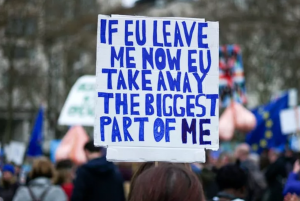 For an excellent take on this march have a look at Brendan O’Neills article on the subject., This placard shows the level of fanatical devotion that some people seem to have to the EU – more akin to a religious cult than a political entity. Meanwhile our favourite Bureaucrats, Barnier, Verhofstadt and Tusk, were tweeting about how they needed to protect and speak up for the 5 million (the number signing the Revoke petition) forgetting both that they already have 500 out of 650 MPs speaking up for them, and that there are 17.4 million people who actually voted to leave the EU – who are about to get shafted. 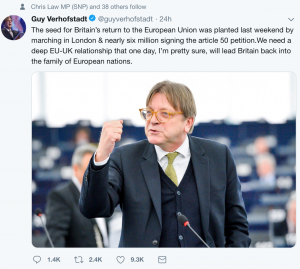 Verhofstadt’s tweet is typical of the arrogance and ignorance he so frequently exhibits. When the UK leaves the EU it is not leaving the European family of nations – it is leaving the EU – remaining, like 20 other European countries – a European nation. In case you wondered why all this matters two news items yesterday should remind you. The EU is put speed limiters on all cars after 2022. So it doesn’t matter what your politicians want, or your local council – it will be the bureaucrats in Brussels who decide for everyone. Even more significantly is there even more radial proposals to severely limit the internet. https://capx.co/the-eus-censorious-copyright-directive-will-create-two-internets/ This will affect this blog and the podcast. Once again the EU are going with the big firms and the corporate lobbyists and limiting both freedom of speech and the free market. The sooner we are out the better. The Who, Bercow, the SNP, Socialists, Greeks, The Swiss, Dentists, Historians and Christ – on Brexit Confusion! Of course it was always about overturning Brexit. It was obvious from before the first referendum that despite the Tories statements that getting a good deal would be easy, the EU was always going to try and push for a second referendum and it’s not surprising that we are almost at that point. I suppose my question is, if it still the democratic will of the UK that we leave the EU, why are Brexiteers so against the idea of a second referendum? Are they afraid that the will of the people has changed and they no longer have a democratic mandate (considering that democratic mandates change every few years in this country)? I’m not entirely convinced anymore that the DUP wanted Brexit in the first place. I suspect they supported it in 2016 for political points with the knowledge that they would probably lose (a lot like Boris Johnson I imagine). I think they come out of this quite well if there is no Brexit or May’s deal against their wishes because they get to play the martyr that stood up for the Union against the Establishment (whether that be Tories in London or technocrats in Brussels). They come out much worse in a No Deal Brexit which has the potential to significantly disrupt Northern Ireland, potentially landing the blame on them. MPs deviating from how they are told to vote is why we are in this mess. Surely, as a Brexiteer, you should want MPs that were elected on a platform to respect the result of the 2016 referendum to be more robotic in that approach. You could call the SNPs robots but surely a party that campaigned on overturning the referendum should be expected to try and fulfil that mandate, at least that is why I voted for them. Is Verhofstadt a bureaucrat having been elected to the European parliament? I don’t disagree that this is a mess. The problem goes back to David Cameron holding a referendum to change the status quo when he obviously did not have the political power to do so and when it was not government policy to try and change the status quo. It is as if Labour held a Scottish independence referendum and then suddenly found it had to implement it. Remind me again, who was it this week comparing his side to Moses? And that’s before you yourself get on to speculating whether the DUP, rather than their politics, are “pure”. If only either side was! The Lord might then have a less challenging task bringing good out of this mess. Oh – and HOW could I forget the gentleman on that enormous perch in the middle of Piccadilly last week, assuring us through a megaphone that Brexit was God’s Will and we should all immediately REPENT and go home? It was the huge, very wordy sign I first noticed – I said to my husband it reminded me of the one formerly carried by that one-time familiar London figure, The Protein Man. But I couldn’t read more than a couple of lines until I’d passed – and then I had to look back to do it. Very tempting to read that as an altogether different “sign”…. Excuse my cyniscism, but no one has mentioned the hip pockets of politicians being affected somewhere in the equation. In my 80 years in this land, like all Aussies I have been necessarily well schooled in being a cynic, as a result we have developed an attitude characterized by a general distrust of politicians’ motives. 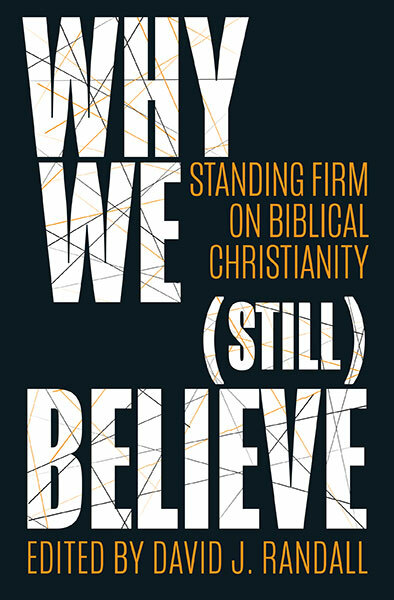 Next Next post: Quantum 35 – Israel and the NZ Mosque; Islamaphobia and Jordan Peterson; The Church in China; Chinese AI; The Mueller Inquiry and Jesse Smollett; The EU and the Internet; The Dutch and the Elderly; Transgender Beer; Scott Walker; Ricky Gervais; and more….